We won't start a "liar, liar pants on fire" chant aimed at HTC because we're pretty excited about a development announced today by the phone maker. After initially telling us there was no "Nexus Edition" of the HTC One in the works, HTC is now revealing that beginning next month, it plans to bring a Nexus user experience to its flagship phone. 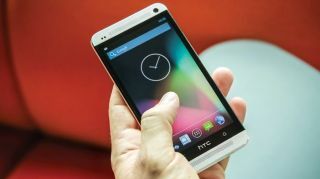 "A special edition of the new HTC One running stock Android will be exclusively available through the Google Play store in the United States starting on June 26," said Jeff Gordon, HTC senior global online communications manager. "This edition pairs the all-metal unibody design, low-light capabilities of the UltraPixel camera and dual front-facing stereo speakers of the new HTC One with the stock version of the latest Android software, Jelly Bean 4.2.2." The phone will be available for $599 (around UK£395, AU$622) and while it's starting out stateside, HTC threw a parenthetical "initially" in its announcement, suggesting we should see the phone hit international markets down the road. The device is supported on GSM networks (AT&T and T-Mobile), and software updates will come via Google. Gordon let us in on a few more details, too: The Google edition of the One will not include BlinkFeed or the Sense camera UX, while the camera itself will be Android through and through. That means Jelly Bean 4.2's Photo Sphere will be part of the package, but it won't have Sense camera experiences such as HTC Zoe, Highlights or the living gallery. For sub-$600, users will get a 32GB, Sense-free handset that follows Samsung's play into the vanilla Android space with its own flagship, the Galaxy S4. The Nexus-ized S4 was announced during Google IO a few weeks back and had many a phone-owning hopeful whetting their beaks at the thought of a TouchWiz-less super phone. Now with HTC throwing its highly regarded handset into the land of Nexus, we could see a few more copycat acts before the year is up. If you want to know what to expect from Windows 8.1, you should direct your eyes to our hub to see what the Softies have in store.